A good example of a non-qualification being 59 Squadron, a unit with a distinguished history in World War One and World War Two – but not enough ‘years served’ because of disbandment after World War One and World War Two. The periods of 1916 to 1920; 1937 to 1950; and 1956 to 1961 do not add up to enough and it did not meet the rather subjective ‘special appreciation’ criterion (which is how 617 Squadron got their Standard). 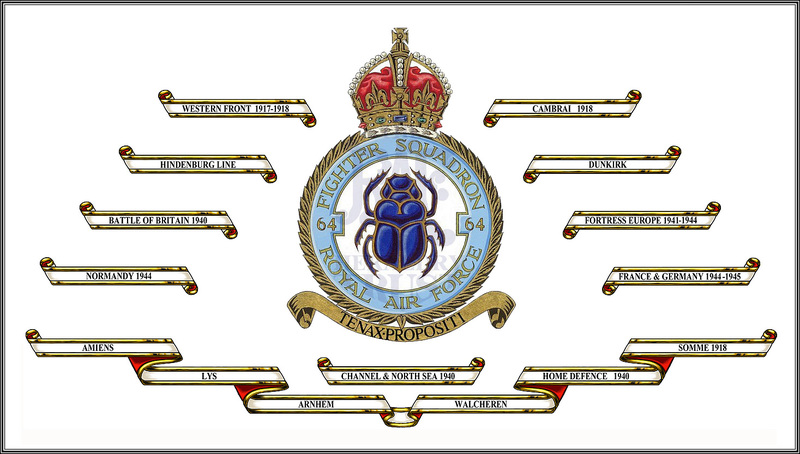 Whereas a unit like 604 Squadron did not form until 1930, so no service in World War One, but stayed in service in March 1957 and so met the 25-years. As a historian I find it hard to accept the rationale imposed! The Standard itself is a 4ft by 2ft 8 in rectangle of RAF light-blue silk, fringed and tasselled in gold and blue. It has a border of roses, thistles, shamrocks and leeks – devices of the countries which comprise the United Kingdom – and a central motif of the approved squadron badge. 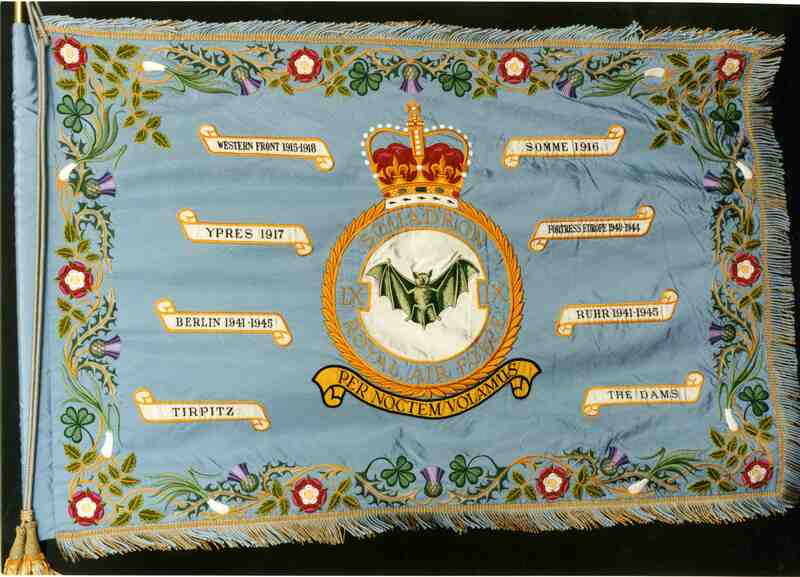 The only other motifs on the Standard are the Battle Honours to which the squadron is entitled, these being depicted in scrolls. The Standard is mounted on an 8ft 1 in staff, surmounted by a gold eagle with outstretched (elevated) wings. 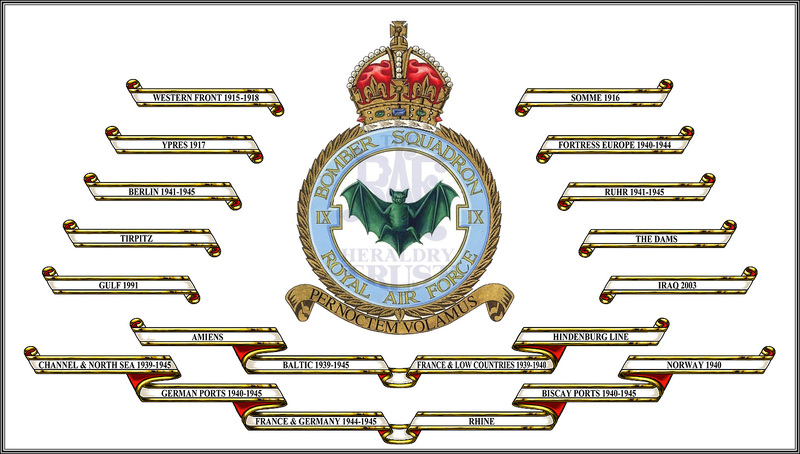 Once the squadron has completed the qualifying requirements it receives a list, from the Air Ministry/MoD, of the Battle Honours to which it is entitled, with a note of those that may be placed upon the Standard. 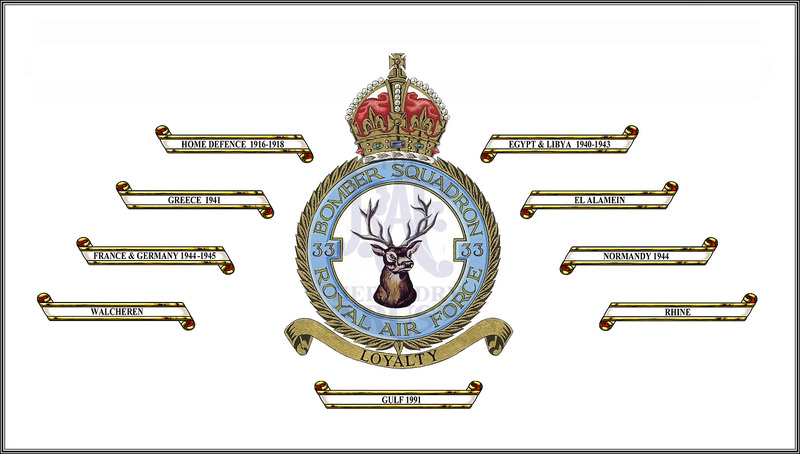 The squadron then selects the honours it wishes to display, to (originally) a maximum of eight, and this, along with the formal request for a Standard is forwarded to the Sovereign for approval. 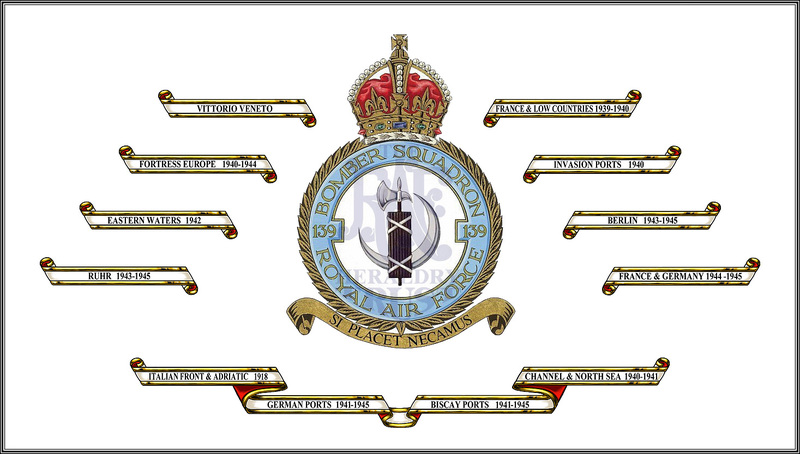 A typical example is that of No 39 Squadron … Sqn Ldr Coghill as CO in 1954 when the first Standard was due to the Squadron had to choose from the following list of Battle Honours to which the squadron was entitled: Home Defence 1916-18, North-West Frontier 1930-31, Mohmand 1933, North-West Frontier 1935-39, East Africa 1940, Egypt and Libya 1940-43, Greece 1941, Mediterranean 1941-43, Malta 1942, North Africa 1942-43 and South-east Europe 1944-45. However, with the policy decision that the operations on the North-West Frontier of India could not be displayed upon the Standard he was left with no choice and all the other Honours were duly represented. The limit of eight Honours appears to have been dictated by purely aesthetic considerations of space and balance on the Standard. As many squadrons had qualified for the limit of eight by their involvement in the two World Wars it meant that any subsequent award would have to be at the expense of an Honour already displayed. However, it appears to have been policy that the conflicts of the so-called post-colonial period should not be recognised in this way and so the problem did not arise. The presentation of the Standard follows a set formal pattern, including dedication ceremony; the same applies to the presentation of any replacement Standard. 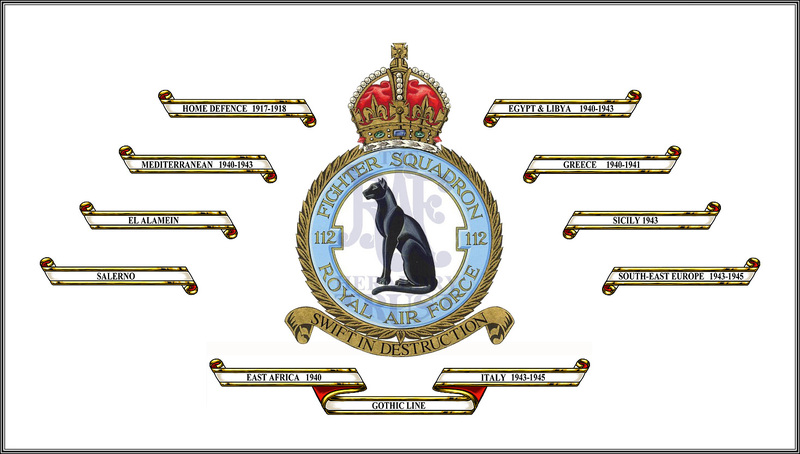 In essence the Standard is the ceremonial flag of the squadron and is only paraded on special occasions – formal parades, Freedom Parades, Dining-in nights, for example. Likewise, when the Squadron disbands, its Standard is formally ‘laid up’. 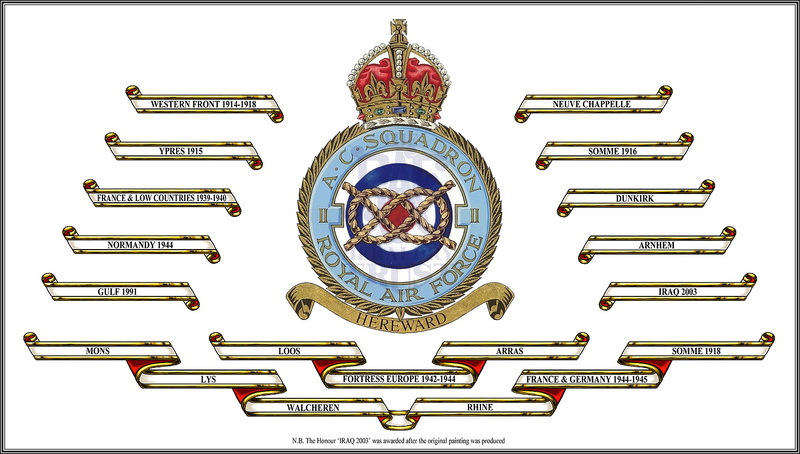 Note: The primary source for information regarding this subject is AP 3327, ‘ Colours and Standards in the Royal Air Force.’ Individual squadron details, i.e. 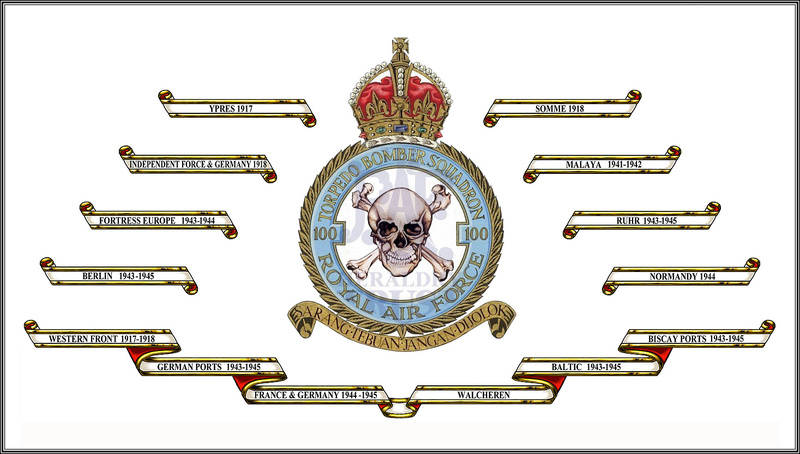 the Battle Honours to which a unit can lay claim, and those it actually chooses to display upon its Standard, come from squadron records. Entitlement to, and presentation of, squadron standards is usually covered by an AMO (Air Ministry Order). The following list gives ALL those Battle Honours which may be used on squadron standards, including the limiting dates (i.e. the period within which the squadron must have been employed in the appropriate campaign/theatre) and brief details of the operations. It is important to note that the dates are limiting dates and that the dates applied by the squadron are those which the squadron actually spent involved in the particular operation (but NOT outside of the limiting dates). East Africa 1915-1917: Operations over German East Africa during its conquest from the enemy, whether by aircraft based in the country or operating from exterior seaplane bases. South-West Africa 1915: Operations by South African Personnel during the conquest of German South-West Africa. Home Waters 1914-1918: Operations over home waters, whether by land-based or carrier-borne aircraft. Home Defence 1916-1918: Interception operations against enemy aircraft and Zeppelins raiding Great Britain. Western Front 1914-1918: Operations in support of Allied armies in Belgium and France. Independent Force and Germany 1914-1918: Squadrons based in France as part of the Independent Force; and for operations over Germany, whether by squadrons based in France (as part of the Independent Force or not) or by carrier-borne aircraft. Italian Front and Adriatic 1917-1918: Operations over the Trentino and neighbouring areas, in support of the Allied armies on the Italian front; and for operations over the Adriatic and attacks on targets on the Dalmatian coast. Aegean 1915-1918: Operations in the Aegean area against the German/Turkish land, sea and air forces, including the attempt to force the Dardanelles, the Gallipoli campaign, and the various operations over the Aegean Sea and against Turkish coastal targets. Macedonia 1916-1918: Operations in support of the Allied Forces at Salonika and in their eventual advance and defeat of the Bulgarian armies in Macedonia and adjoining territories. Mesopotamia 1915-1918: Operations over Mesopotamia and Persia in the liberation of Mesopotamia from the Turks. Palestine 1916-1918: Operations over Palestine, Transjordan and Syria, in the liberation of those territories from the Turks. Arabia 1916-1917: Operations over Arabia, in support of the Arab Revolt against the Turks. Egypt 1914-1917: Operations by squadrons based in Egypt during the Turkish advance on the Suez Canal across Sinai; and for operations in the Western Desert against the Senussi. 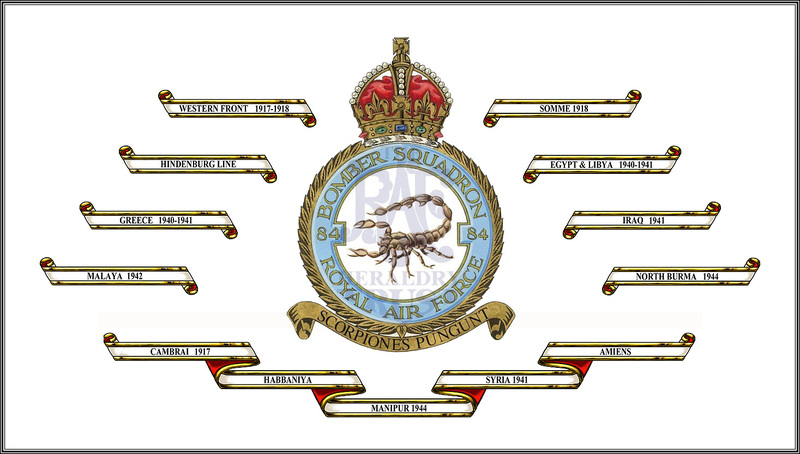 The numerous inter-war campaigns, especially in India, entitled squadrons to Battle Honours but these could NOT be placed on the Squadron Standard. The eligibility was also not so clear cut and was determined by an Air Council committee which examined squadron records announced its decision. For details of the campaigns listed below see the relevant chapter. RAF squadrons were also entitled to lay claim to Army Battle Honours, the Air Ministry would approve such claims if the squadron could prove its ‘intimate participation in the land battle’. Battle of Britain 1940: Interception operations by fighter squadrons in the Battle of Britain (August to October 1940). Home Defence 1940-1945: Interception operations after the Battle of Britain, in defence of Great Britain and Northern Ireland against enemy aircraft and flying bombs. Invasion Ports 1940: Bombing operations against German-occupied Channel ports, to dislocate enemy preparations for the invasion of England. France and Low Countries 1939-1940: Operations in France and the Low Countries between the outbreak of war and the Fall of France (3rd September 1939 to 25th June 1940). Applicable both to squadrons based in France (the Air Component and the Advanced Air Striking Force) and to squadrons operating from home bases. Dunkirk: Operations covering the evacuation of the British Expeditionary Force and the French from Dunkirk 26th May to 4th June 1940. Atlantic 1939-1945: Operations by aircraft of Coastal Command and others employed in the coastal role over the Atlantic Ocean from the outbreak of war to VE Day. 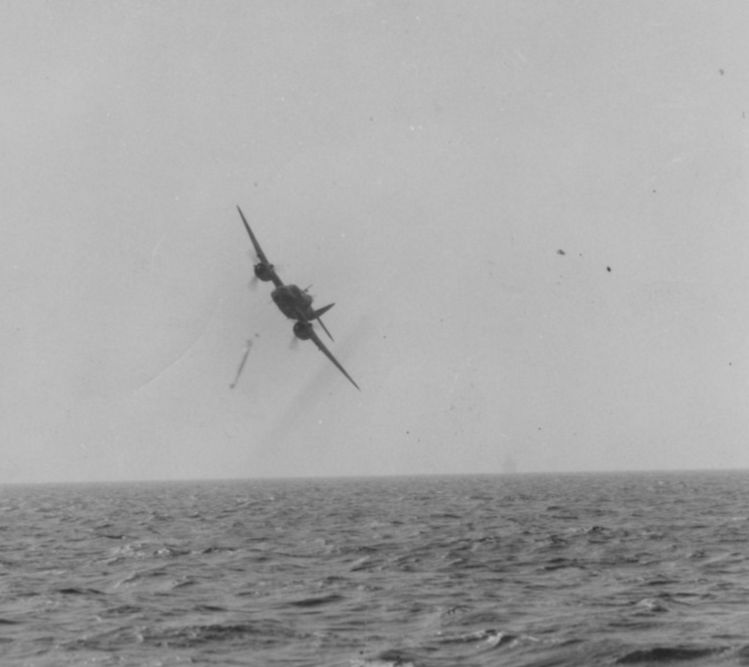 Bismarck: Operations by aircraft of Coastal Command associated with the action against the Bismarck (24th to 29th May 1941). Channel and North Sea 1939-1945: Ship attack, anti-submarine, and mining operations over the English Channel and North Sea from the outbreak of war to VE Day. 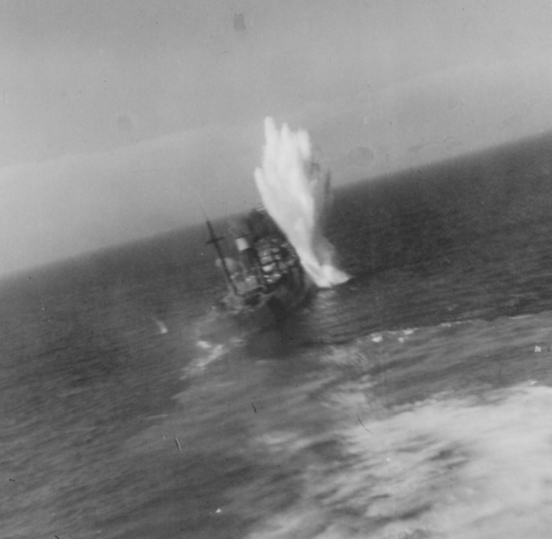 Tirpitz: Operations resulting in the sinking of the Tirpitz. Greece 1940-1941: Operations over Albania and Greece during the Italian and German invasion, whether carried out by squadrons based in Greece or operating from external bases (28th October 1940 to 30th April 1941). South-East Europe 1942-1945: Operations over Yugoslavia, Hungary, Romania, Bulgaria Greece. Egypt and Libya 1940-1943: Operations in the defence of Egypt and the conquest of Libya, from the outbreak of war against Italy to the retreat of the Axis forces into Tunisia (10th June 1940 to 6th February 1943). El Alamein: Operations during the retreat to El Alamein and subsequent actions (June to November 1942). Malta 1940-1942: Squadrons participating in defensive, offensive, and reconnaissance operations from Malta during the period of enemy action against the island (10th June 1940 to 31st December 1942). North Africa 1942-1943: Operations in connection with the campaign in French North Africa, from the initial landings in Algeria to the expulsion of the Axis Powers from Tunisia (8th November 1942 to 13th May 1943). Mediterranean 1940-1943: Operations over Italy, Sicily and the Mediterranean and Aegean Seas by aircraft based in the Mediterranean area (including reconnaissance, convoy protection, mining, and attacks on enemy ports and shipping) between the entry of Italy into the war and the initiation of air action preparatory to the Sicilian campaign (10th June 1940 to 30th June 1943). Sicily 1943: Operations in furtherance of the conquest of Sicily (1st July to 17th August 1943) by aircraft based in Africa, Malta and Sicily. Italy 1943-1945: Operations over Italy. Salerno: Operations in support of the Allied landings in Italy (9th to 16th September 1943). Anzio and Nettuno: Operations in support of the Allied landings at Anzio and Nettuno (January 1944). Gustav Line: Squadrons participating in the operations against the Gustav Line (May 1944). Gothic Line: Air Operations in support of the breaching of the Gothic Line (August to September 1944). Norway 1940: Operations over Norway during the German invasion (9th April to 9th June 1940): applicable both to squadrons based in Norway and to those operating from home bases. Baltic 1939-1945: Operations over the Baltic and its approach by squadrons of Bomber and Coastal Commands from the outbreak of war to VE Day. Fortress Europe 1940-1945: Operations by aircraft based in the British Isles against targets in Germany, Italy and enemy-occupied Europe, from the Fall of France to the invasion of Normandy. The Dams: Squadrons participating in the operations for breaching the Moehne, Eider, Sorpe and Kembs Dams (May 1943 to October 1944). Dieppe: Squadrons which participated in the combined operations against Dieppe on 19th August 1942. France and Germany 1944-45: Operations over France, Belgium, Holland and Germany during the liberation of North-West Europe and the advance into the enemy’s homeland, from the initiation of air action preparatory to the invasion of France to VE Day (April 1944 to 8th May 1945). Biscay 1940-1945: Operations over the Bay of Biscay by aircraft of Coastal Command and Fighter Command, and Bomber Command aircraft loaned to Coastal Command, between the fall of France and VE Day (25th June 1940 to 8th May 1945). Ruhr 1940-1945: Bombardment of the Ruhr by aircraft of Bomber Command. Berlin 1940-1945: Bombardment of Berlin by aircraft of Bomber Command. German Ports 1940-1945: Bombardment of the German ports by aircraft of Bomber and Coastal Commands. Normandy 1944: Operations supporting the Allied landings in Normandy the establishment of the lodgement area, and the subsequent break-through (June to August 1944). Arnhem: Squadrons participating in the operations of the Allied Airborne Army (17th to 26th September 1944). Walcheren: Operations in support of the capture of the Island of Walcheren (3rd October to 9th November 1944). East Africa 1940-1941: Operations over Kenya, the Sudan, Abyssinia, Italian Somaliland, British Somaliland, Eritrea, and the Red Sea, during the campaign which resulted in the conquest of Italian East Africa (10th June 1940 to 27th November 1941). Pacific 1941-1945: Operations against the Japanese in the Pacific theatre, throughout the war with Japan (8th December 1941 to 15th August 1945). Malaya 1941-1942: Operations against the Japanese in Malaya, Sumatra and Java, from 8th December 1941, until the final capitulation in Java on 12th March 1942. Ceylon April 1942: Operations against Japanese aircraft and naval units by squadrons based in Ceylon during the Japanese attacks of April 1942. Eastern Waters 1941-1945: Operations over waters east of the Mediterranean and Red Sea, including the Indian Ocean, the Bay of Bengal the Java Sea, and the South China Sea, throughout the war with Japan. Burma 1941-1942: Operations in defence of Rangoon and in support of British Forces during the Japanese invasion of Burma (December 1941 to May 1942). Arakan 1942-1944: Operations by fighter, bomber and transport squadrons in support of the first and second Arakan campaigns (November 1942 to February 1943, and November 1943 to March 1944). North Burma 1943-1944: The supply by air of General Wingate’s first long-range penetration into North Burma (February to June 1943) and for the air supply and support of his second expedition (5th March to 26th June 1944). Manipur 1944: Operations in support of the besieged forces at Imphal (March to July 1944). Burma 1944-1945: Operations during the 14th Army’s advance from Imphal to Rangoon, the coastal amphibious assaults, and the Battle of Pegu Yomas (August 1944 to August 1945). Special Operations: Operations by squadrons regularly assigned to special duties, i.e. the succour of resistance movements in enemy-occupied countries by dropping supplies and by introducing and evacuating personnel by air, from the formation of the first special duty flight (20th August 1940) after the Fall of France to VE and VJ Days. Arctic 1940-1945: Operations over the Arctic by squadrons of Coastal Command based in Iceland, Russia and the Shetlands. Russia 1941-1945: Operations from Russian bases. Iraq 1941: Operations in the defeat of Rashid Ali’s rebellion (2nd to 31st May 1941). Habbaniya: Units engaged in the defence of Habbaniya (30th April to 6th May 1941). Syria 1941: Operations over Syria during the campaign against the Vichy French (8th June to 12th July 1941). It is a sad fact of 20th Century politics that the RAF has rarely been ‘at peace’ for more than a few years at a stretch since 1945. However, the granting of Battle Honours played no part in any of these ‘post-colonial’ conflicts. As has been explained above, this is in large part due to the politics of any given situation; Suez should, by all normal military standards, have earned a Battle Honour for the participating squadrons. However, some of the more recent conflicts have been awarded Battle Honours, and even an increase in the number of Honours that could be displayed on the Standard.